The French Jesuit mathematician Claude Dechales (1621–1678) was best remembered for his book Cursus seu mundus mathematicus, a complete course of mathematics, published in Lyons in 1674. 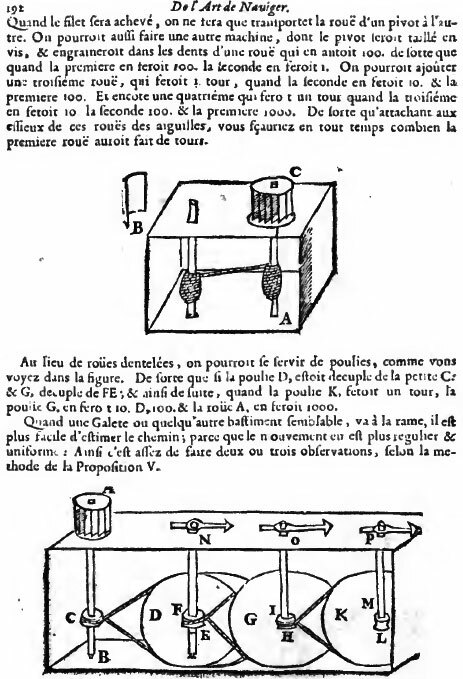 Dechales published also several other books, and in one of them—L' art de naviger demontré par principes & confirmé par plusiers observations tirées de l'experience, published in Paris in 1677, he described a small counting device with a ratchet wheel as input and analog display indicators (see the image below). The counting device is described in a section for the calculation of distances. Its purpose is to measure the force of wind. The horizontal wheel, one or two feet in diameter (marked with C on the upper drawing), composed of small cone-shaped wings, rotates according to the force of wind. The motion from wheel C is transferred to the inner counting wheels D, G, K, etc., connected to display indicators N, O, P.
Claude François Milliet Dechales (aka Milliet de Challes, or Deschales), was born in 1621 in Chambéry, Savoy. He was the youngest son (of three) of Hector Milliet, Baron de Challes and d'Arvillars (1568-1642), and his second wife Madeleine de Montchenu (1586-1651). Claude's grandfather, Louis Milliet (1527-1599) was a jurisconsult, first president of the Senate of Savoy, Grand Chancellor and ambassador. He obtained the title of Baron in 1569, buying the seigneuries of Faverges, then of Challes. Claude's father, Hector Milliet, became Baron de Challes in 1618, then he acquired the lordship of Arvillars in 1628, and took the name Milliet d'Arvillars. He was the first president of the Chamber of Accounts of Savoy, then first president to the Sovereign Senate of Savoy and ambassador. Claude's elder brothers Jean Louis (1613-1675) and Sylvestre (1616-1685) inherited from his father noble titles Marquis de Challes and Marquis d'Arvillars, but Claude choose a religious and scholarly career. At the age of 15 (21 September, 1636) he entered the Jesuit Order. By the time Dechales entered the Order it contained over 16000 men. The main task of the Jesuits was education, but the next most important task was missionary work throughout the world. After spending some 10 years in education, in the middle 1640s Dechales was sent as a Jesuit missionary to Turkey, where he taught letters there for nine years. After his return to France around 1656, Dechales lectured at Jesuit colleges, first in Paris where for four years he taught at the Collège de Clermont. Then he taught philosophy, mathematics and theology at College de la Trinite de Lyon and was a rector at Chambéry. From Chambéry he went to Marseilles, where King Louis XIV appointed him Royal Professor of Hydrography. In Marseilles he taught navigation, military engineering and other applications of mathematics. From Marseilles he moved to College of Turin, in Piedmont, where he was appointed professor of mathematics. Claude Dechales was known for his friendliness and pedagogical competence in the teaching of mathematics and for his ability to teach and write clear explanations of technical topics, not for his research ability, advanced mathematical imagination or originality of his work. Claude François Milliet Dechales died on 28 March 1678 in Turin, Italy.